Stephen is responsible for the strategy, development and management of the business. He joined RW Bell in 1983 and since then has accumulated a wealth of over 30 years experience in the contracting industry. With a strong economic background he became contracts manager/estimator in 1992, then in 1997 was appointed Managing Director. Stephen has a wide knowledge of the electrical industry and has served on the Central Board of SELECT (Scottish Electrical Contractors Association) and as Tayside Branch chairman for a number of years. Alan has over 30 years experience having joined RW Bell as an apprentice in 1984, he was electrical supervisor and contracts manager before becoming a Director in 1999. 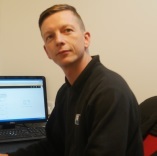 Alan now manages the Electrical and Renewable divisions of R.W.Bell, he is responsible for quotations and the design and management of contracts. Along with his commitment to RW Bell, Alan has been retained fire-fighter in Pitlochry for over 25 years, where is now Watch Manager in charge of Pitlochry Fire Station. Greg joined RW Bell as an apprentice in 2005 and was made a Director in 2015. He is responsible for the management of our Building Services 'All Trade' contracts from quotation through to completion. Greg also manages the Audio Visual department and assists Alan with overseeing the electrical department. Along with his commitment to RW Bell, Greg has been a retained fire-fighter in Pitlochry for over 10 years where he is now Crew Manager at Pitlochry Fire Station. Malcolm joined RW Bell in 2004 when the Joinery department was established. Acting as Joinery Manager, Malcolm has over 30 years experience within the Joinery industry. Along with his commitment to RW Bell Malcolm has been a retained fire-fighter for Pitlochry for over 25 years. Robert joined RW Bell in 2011 and is responsible for managing the Plumbing and Heating department. He is also heavily involved in the running of the Renewables division specialising in solar thermal heating, heat pumps and biomass.